Located in the heart of historic Bury St Edmunds, West Suffolk the cathedral town's Christmas fayre, which runs from Thursday 22nd to Sunday 25th November, showcases a huge selection of traditional and contemporary arts and crafts and gifts as well as an inspired selection of food and drink from the region and around the world. Browse and shop at around 300 stalls set out along the town's medieval streets and gardens as well as within the historic and contemporary venues and attractions including St Edmundsbury Cathedral, The Athenaeum, historic Abbey Gate, medieval Moyse's Hall, The Apex and the contemporary Arc shopping centre. The Abbey Gardens provides a magical festive atmosphere with over 100 stalls, free children's entertainment, real reindeer and Santa and his elves in their winter workshop. There's also lots of delicious food and drink to sample including wine, waffles, cakes and cheeses. A World Market can be found on Angel Hill, the centre of Bury St Edmund's historic medieval core, with over 100 stalls, a traditional funfair and the Greene King stage with live music and entertainment throughout each day. At The Athenaeum, where Charles Dickens once gave readings of his work, there's handmade gifts particularly fine art, jewellery and cards. Many stall holders will also be wearing period costume adding to the effect of this historic Georgian building. Foodies will love the St Edmundsbury Cathedral Courtyard with stalls selling everything from fruit gin to local honey, artisan sauces to scrumptious Christmas puddings. This is where you will find the Infusions Cookery Theatre with cookery demonstrations to get some tasty Christmas food ideas. Dating back to before the days of William the Conqueror, the town's market will be open from Friday to Sunday. Shop for everything from fresh local produce to authentic Italian shirts and from Portuguese pottery to colourful plants and flowers. There's also a farmer's market with more local produce on the Sunday. Don't miss the opening parade on Thursday 22nd November; the first day also closes with a firework display in the Abbey Gardens starting at 7.45pm. Pre-booked coach parties are very welcome at Bury St Edmunds Christmas Fayre and will receive a pack of information including maps and any special offer vouchers and a free meal voucher for either the driver or the organiser. The coach driver will also be offered a free taxi to and from the Fayre and all coaches will be met by a team of friendly stewards. 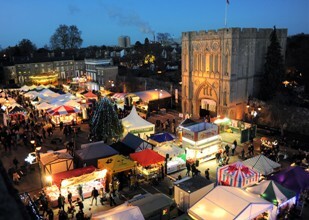 For more information about bringing a coach party visit http://www.burystedmundschristmasfayre.co.uk details about where to stay and other things to see and do in Bury St Edmunds and the surrounding area can be found on http://www.burystedmundsandbeyond.co.uk.